OUR MISSION: Common Ground is a center for learning and leadership, inviting people across ages and identities to connect to their urban environment, build community, grow into their full potential, and contribute to a just and sustainable world. The nation’s longest-running environmental charter school, creating the next generation of successful college students and powerful environmental leaders. An urban demonstration farm, modeling practices of sustainable agriculture and contributing to a healthy food system for New Haven residents. 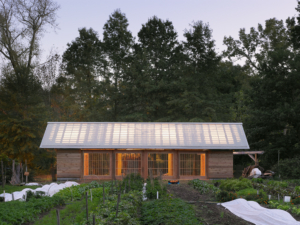 A community environmental education center, offering programs that connect people of all ages with the natural world while helping them develop habits of sustainable living. 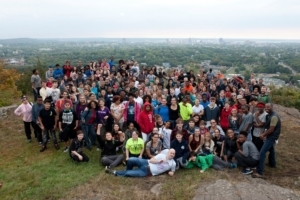 As a whole, Common Ground is a center for environmental learning and leadership located in New Haven, CT. It is a place where all members of the community – young and elementary-aged children, middle and high school students, the general public, and environmental practitioners – can find connections to the local environment, each other, and opportunities for learning and engagement. Common Ground connects farm, forest, and city. Our working farm includes production and educational gardens, and a variety of animals. Located at the base of West Rock Ridge, our site includes 20 acres of forest with hiking trails, wildlife, and diverse natural habitats. 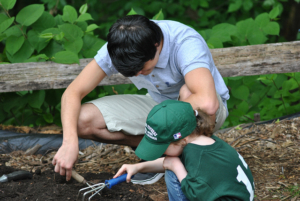 Within New Haven city limits, Common Ground seeks to explore urban ecology and develop paths to urban sustainability. We are rooted in our place—a farm, in a forest, in the City of New Haven. The people and ecology of our place are the foundation of all we do. Our work starts here, and ripples outward. Learn more about our place and our people. Learning and leadership take many different forms—and everyone can be a powerful learner and leader in their own, authentic way. We are dedicated to providing many different opportunities for people to learn, grow, and take action to improve the world, including through direct, authentic exploration and discovery of nature, our food sources, and the local community. Commitment, passion, and creativity inspire everything we do. We endeavor to balance our hard work with joyful adventure. Diversity is essential to healthy, resilient ecological and human communities. Just as we are committed to conserving and supporting biological diversity, we are committed to cultivating a diverse human community that thrives within an environment of trust, equity, dignity, and interconnectedness. Future generations have a right to share equitably in our human, environmental, and economic resources. We recognize that change is inevitable, and embrace change that is sustainable—positive, measurable, just, and lasting. Learn more about our sustainability work.